Alexia's son with his beloved ski instructor. All photos by Alexia Brue. 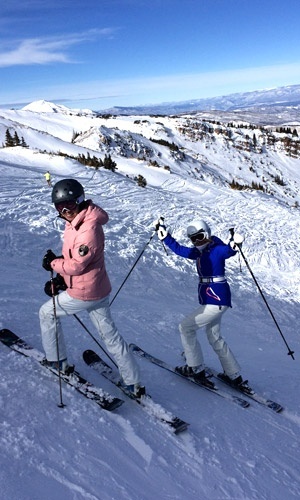 We know that , one of the ski resorts in Aspen/Snowmass, bills itself as very family-friendly. We checked in with Alexia Brue, a trusted pal the the publisher of , to see why she and her brood keep going back. 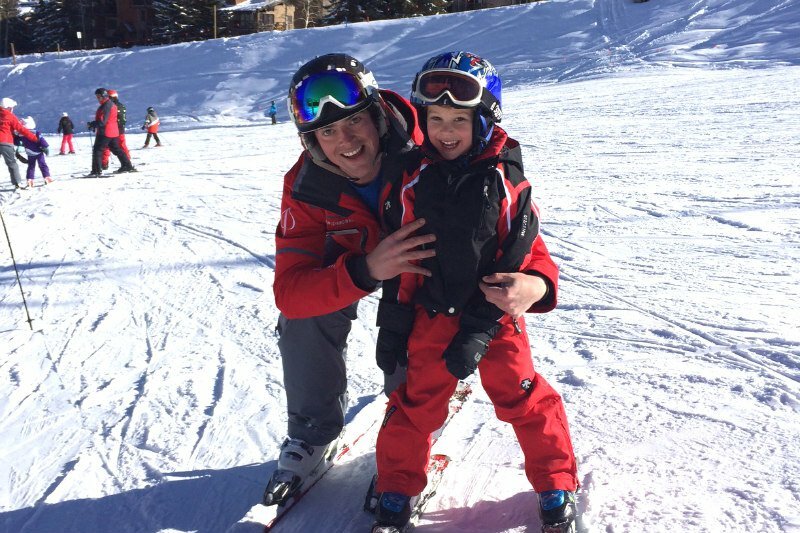 Why Snowmass for a family ski vacation? The ! It's all about the Treehouse. Snowmass's childcare center is Alpine paradise for kids. Ours were so comfortable there that we go back to Snowmass just for that reason — even though there are superb ski mountains much easier to get to from New York. Hello, Park City. At the Treehouse, my three-year-old daughter skis for an hour a day, then does art projects and bakes reindeer cookies with counselors who truly love children. My son is five, so he gets to ski all day with Treehouse instructors and only goes indoors for hot chocolate and lunch. We thought the full day would be too intense, but he loved it. He's still talking about one counselor, Andrew, four weeks later. My husband and I could ski guilt-free, knowing that our children were having the best time in loving, expert hands. We've been to Snowmass three times and have rented a condo or a house every time. There's so much condo inventory, and they're comparably priced to hotels, only you get much more: a washer/dryer, a kitchen, and yards more room. We stayed at for a night, and even though it was new and well run, it felt cramped with all our ski stuff. All that condo inventory means you can negotiate and get a great deal during non-prime weeks. We used a broker at , just one of the real estate companies out there. Because they believe that renters turn into buyers, many real estate agents deal in weekly rentals. We selected from more than five places that met our criteria and ended up in a huge two-bedroom with ski-in/ski-out access for the same price as a room at the . For people who want room service and hotel perks, Westin and Viceroy are both nice. Westin is better located for ski-in/ski-out; Viceroy is the nicer property. Let's get on the slopes. What's the mountain like? Snowmass is a good-sized mountain, with relevant terrain for everyone. For kids, there are lots of bunny hills and the learn-to-ski area feels protected and safe. Adults can rip it up on Cirque Headwall (12,500 feet) and the various runs around Campground. And we love that even during a busy week like Christmas, the lines are very manageable. Did you go to the nearby mountains? The bus system makes it easy to mountain hop, but the trails at Snowmass are comprehensive enough that we're happy just skiing there. What's the après ski scene? During the spring ski season, the fun vibe at Base Village makes it a great place to grab a drink and a bite. There isn't really a place "to be" the way there is in Aspen. Or maybe there is, and I'm just not one of the cool kids. Most people pick their kids up from Treehouse and grab an early dinner at in the Snowmass Village Mall. (Don't worry, it's an outdoor mall.) The Stew Pot's chili always hits the mark. Then it's a jump in a hot tub, a game of Othello, and asleep by 9 p.m. For a night out without the kids in Snowmass, has a fun bar and a solid restaurant. For a serious meal, people head into Aspen for dinner at or . And if you don't want to ski? is a sweet place to unwind. It's easy to stretch a treatment into a whole morning or afternoon because there's a heated outdoor pool and hot tub area. There's also a groovy, high-design relaxation area where you can drink Champagne and read magazines before of after the top-notch treatments. I always just have a massage, nothing fancy. For something more active, you can rent snowshoes, take the Elk Camp Gondola to the top, and do one of the . The is also wonderful. It offers fitness classes, a rock wall, and an outdoor pool. You just pay a to use it. We've been three times and will definitely go back. Snowmass has a warm, welcoming, casual vibe, and the views — majestic is an understatement — will never get old. У нашей фирмы полезный блог , он рассказывает про https://yarema.ua.